‘the farm proper’ is a mobile, urban farm under development by interdisciplinary creative studio set & drift in collaboration with mi-workshop in barrio logan, san diego. maintained by artists, designers and backyard growers, this experimental project uses abandoned and re-purposed shopping carts as the main tool in growing organic vegetables. in doing this, the goal was to create a replicable model for urban cultivation and pocket farms. This is silly. Abandoned shopping carts? Really? These all appear to be in good working order—except that someone has filled them with soil. Whenever I see “abandoned” shopping carts, it’s likely they’ve been stolen. These things cost a ton and theft is a big problem. There are even retrieval services that specialize in returning lost carts, not to mention many attempts at corralling the carts on the store property—coin deposits, magnetic and mechanical mechanisms etc. Why not build raised beds out of broken pallets? Or better yet, amend the existing soil and plant in the ground. As a one off piece of guerilla art, this is fine. But a “replicable model for urban cultivation” it is not. totally agree. that’s not really called recycle where I come from. that’s theft … can’t find the owner??? for god’s sake they have the logo on the side… please dont ‘create a replicable model for urban cultivation and pocket farms’. we should call the police! yes, because you should defend walmart those carts cost nothing to them. who cares. Either way its a clever idea. Props to you man. great idea for old carts that the stores throw away by the billions every year. on a flat level surface you could grow and then move with the sun if limited light is available like a flat roof. good idea but i agree should only use old throw aways not new carts. cool idea. metal drums on wheels trash cans on wheels why not carts. stores do NOT throw away or “comfortably lose” shopping carts; they cost a fortune to make and maintain. PAID services corral and return the carts if they are lost or stolen, and it is a punishable crime to remove them from store property. the reason the costs of the goods or serves inside the stores are high is due to things such as this: lost profits in other areas. stop stealing carts and the company doesn’t have to spend money to employ someone to look out for the population’s lack of understanding about cause and reaction. Wow, I’m guessing many of the comments are from people far removed from an urban center who have no idea that shopping carts are often stolen by homeless, used to cart their bottles and belongings around and then abandoned, yes abandoned. I have never seen a Ross store employee, police office or auxiliary police patrolling for such abandoned carts. At least someone’s out there cleaning up the streets. They look far better with greenery than polluting underpasses and landfills. Show some appreciation! I think its a great idea, As long as your not stealing them. Im pretty sure that stores do throw away old carts….what do they do with the old ones when they get new ones? I doubt they keep them. I mean, they probably recycle them but this is a different way of recycling them. Really? You guys are freaking out over “stolen” shopping carts? Fail to you. I would bet money that you are the kind of people whose only concern is the latest fashion, the hottest clubs, the newest “bling” and the biggest SUV. Theft is theft and should be prosecuted to the fullest. Carts are not thrown out, they are sent out to be rebuilt. And for those not in the know, even smaller metro areas have enterprising people who have businesses that all they do is gather and return carts to their rightful owners. get with it people someone is doing something to provide food from consumer based waste IE shopping carts. things that shouldn’t be used anyways thats what we have hands for people. get a grip on reality and step outside your comfy little lives and realize that urban farming with or without shopping carts is what it is coming to. with oil spills and people that care more about “laws” than about feeding their fellows humans shame on you all for talking negative. I completely agree, with both sides, it is theft – but it’s from an industry that we could do without if everyone grew a bit of veg, and traded with their neighbours. 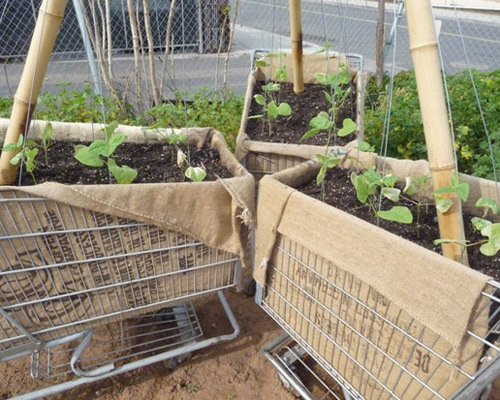 This idea is a great one for small urban farmers, and I’ll definitely keep my eyes peeled for carts left around by people who litter.